David serves as Associate Professor & Extension Agronomist at Virginia Tech’s Tidewater Agricultural Research and Extension Center. He provides leadership for agronomic extension and research programs that lead to profitable and environmentally-responsible agriculture. 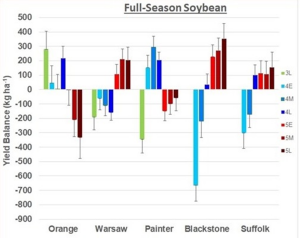 April planting is thought to have an advantage over May planting because we can shift the development of soybean to an earlier time of the year where there is more sunlight. More total sunlight per day should result in greater yields. But, does this hold up in Virginia? Likewise, an earlier variety will also shift maturity, and the critical stages of development, to a time of the year when the days are longer. So in theory, planting early-maturing varieties early should result in the greatest yields. My concern is that when you shift your development to earlier times of the year, you are also placing the most critical pod and seed development stages in a hotter and drier time of the year. While you could possibly alleviate the dry part with irrigation, I know of no way to keep the temperature from rising. To test these hypotheses, we planted 10 to 12 varieties ranging in maturity from late-3’s to early-6’s in April, May, and June at three Virginia locations in 2017 and 2018. I’m not going to show the data because we found relative maturity responded differently depending on location, and it would just take up too much room to show all the graphs. 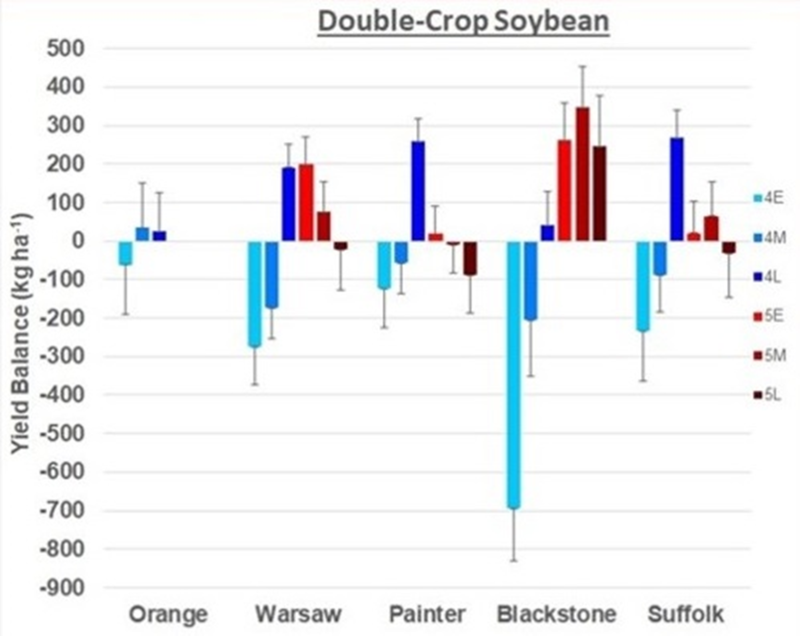 However, we have seen no benefit to planting soybean in April versus May, although April plantings did not usually yield less than May plantings. Maturity group response depended more on location and when the rain fell. So, I suggest that you base your planting date and or relative maturity decisions on your need to spread out planting or harvesting. April planting date is OK, but not necessary for greater yields. Keep in mind that soils are usually cooler in April, so it will normally take soybean longer to emerge than when planted in May. Fungicides will be needed for April and early-May plantings. If you do plant in April and/or want to use early-maturing varieties, then do this on your best soils. 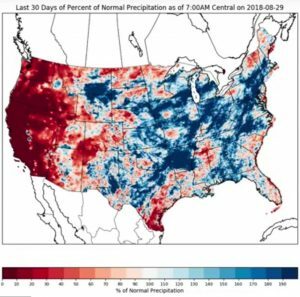 If you move the critical stages of development to a hotter and drier time of the year, you’ll need the greater water-holding capacity of those soils. In general, high seed costs have resulted in a reduction in the number of soybean seed planted per acre. For our full-season production system, most have reduced their seeding rate to 140,000 or less. Some have even had success with rates as low as 80 to 100 thousand seed/acre. My research over the years has shown that we only need, on average, about 70 to 80 thousand plants/acre to maximize our yield. But is this too low? Yes, it could be – in some situations. There is also interest in varying seeding rates. I said many years ago that it appears that this is possible. 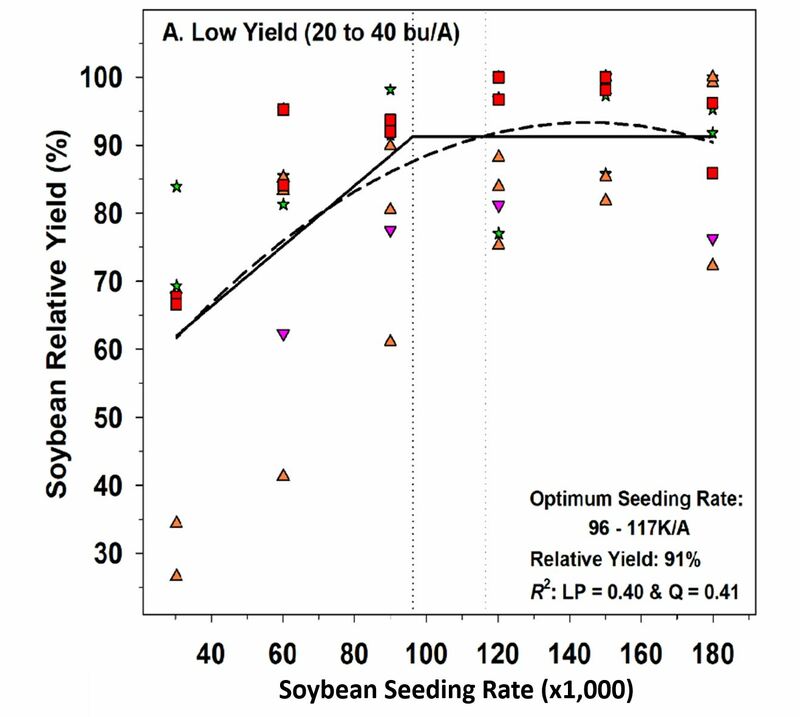 But our approach to variable-rate soybean seeding will be just the opposite of how we vary our rates with corn. With corn, we increase seeding rate as our yield potential increases. 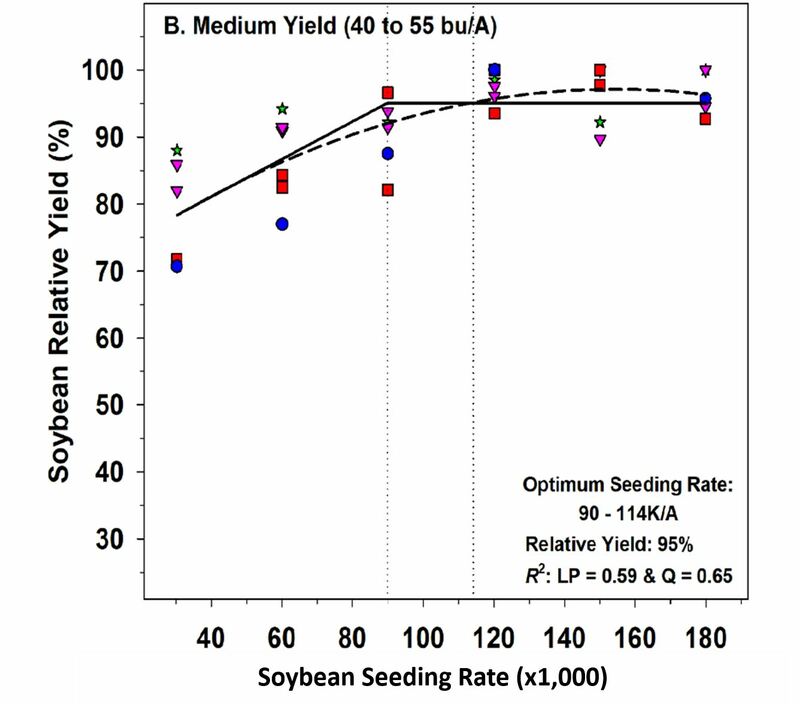 With soybean, we do just the opposite – we reduce our seeding rate as yield potential rises. 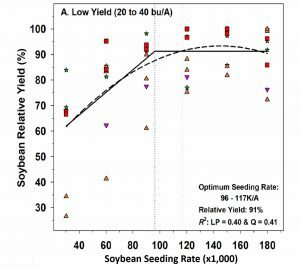 But, how much can we reduce seeding rate with rising yield potential? To answer both questions – Is a final stand of 70 to 80 thousand plants too low? 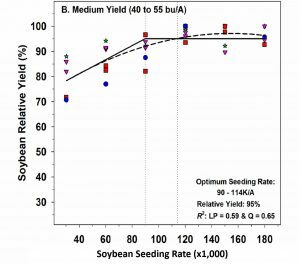 and How do I vary soybean seeding rates?, I analyzed over 10 years (over 25 experiments from 2003-2011) of on-farm and small-plot research to determine the optimal seeding rate for three different yield potentials. The results along with my recommendations are shown below. Plant 120 – 140 thousand seed /acre. Why not less? 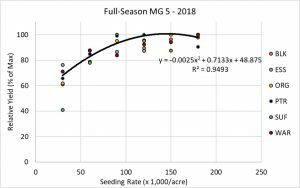 The data to the left indicates that the optimal seeding rate (area between the two vertical dotted lines) ranges between around 100 to 120 thousand seed/acre. Why is this not my seeding rate. There is too much variability in the data; therefore too much risk. In some years, yields could have been reduced with this rate. So, I’m hedging towards less risk at these yield potentials. Plant 100 – 120 thousand seed/acre. 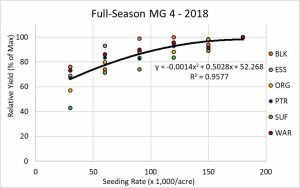 You will notice that the optimal seeding rate has declined to around 90 to 110 thousand seed/acre. Note that this is only about 10,000 seed less that the previous graph, but I lowered my recommendation by 20,000 seed. Why? There is little variability in these data; hence, I have more confidence. Plant 90 to 110 thousand seed/acre. Like low yield potentials, I’m starting to hedge a little here towards less risk although my data indicates that I can go lower. There were cases where is took nearly 120,000 seed to get the maximum yields. With our maturity group 4 trials, we saw yield continue to rise with seeding rate, and our yields were in the high range (about 50 to 60 bushels/acre). 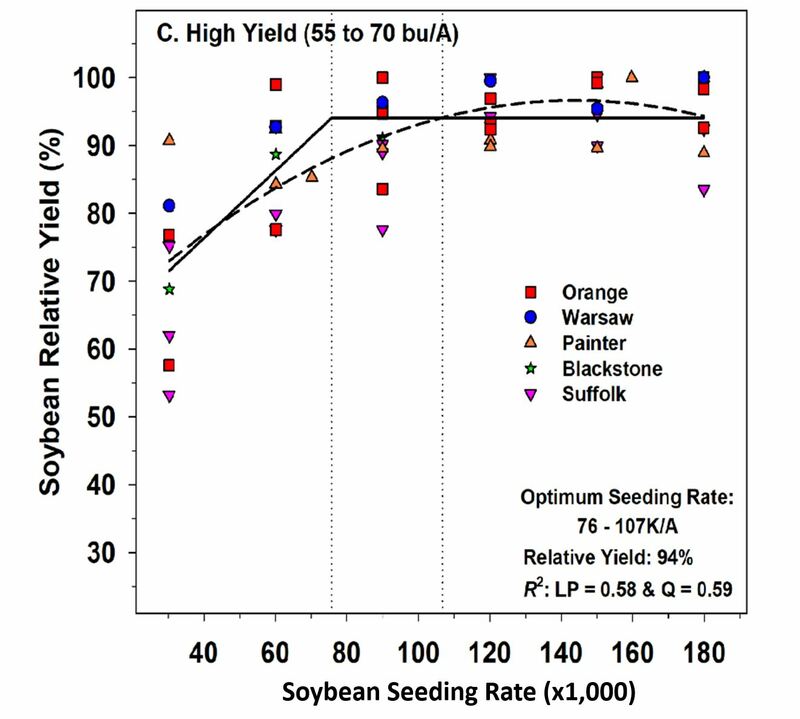 But yields with the group 5 soybeans tended to level off at about 120 thousand seed/acre. Why a different response and why did maturity group matter? I think the answer is lack of sunlight. Total photosynthetically-active radiation interception differences are one of the reasons that we get yield responses to seeding rate. In most cases, this is a lack of leaf area; we are not intercepting all the light. But, this was not the case in 2019. We had what I normally consider enough leaf area, at least enough for a sunny year. But we had less light in 2019. The group 5 soybean did have more leaf area than the group 4 soybean; I’m assuming that these few extra leaves made up a little for the lack of light. Cloudiness is one of the risks we take. Still, I won’t change my recommendations based on last year since it was rather unusual. 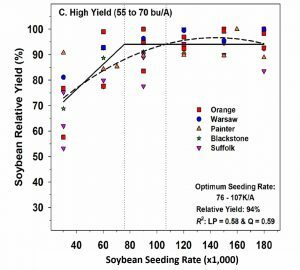 Improving Your Soybean Variety Selection Decisions – What maturity is best? Variety selection continues to be one of the most important decisions that we can make. It is also one of the first steps to take that insure success. It’s a hard choice because there are so many varieties available. Still, this choice is one that will affect your profitability throughout the year. Soybean yields in our variety tests have increased by an average of 0.4 bushels per year over the last 30 years. Some of this increase is due to better varieties, some is due to better management. In those tests, the highest and lowest yielding varieties varied by 20% or more (8-10 bushels). 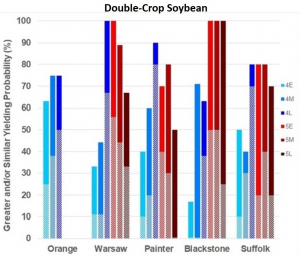 It is therefore clear that making the wrong choice will seriously impact next year’s soybean crop. Unfortunately, environment (rainfall, temperature, soil type, field, etc.) affects yield variation more than variety – there is always lots of year-to-year and site-to-site variation. Still, each variety has specific strengths and weaknesses that make it more or less suited for any given situation. With all this variation, it is very important that you place the right variety in the right field. This will be influenced by 1) planting full-season or double-crop; 2) maturity; 3)herbicide tolerance; 4) disease and/or nematode tolerance; and finally 5) yield potential. There are also a number of other factors that differentiate varieties such as shattering and lodging susceptibility, height, branching ability (thin vs. bushy), seed size, seeds/pod, protein and oil content, other specific traits, etc. ), but these will rarely affect your bottom line. Although all of the top five things I listed are important, yield potential is clearly what is of most interest. However, if you do not pay attention to numbers 1 through 4 first, your yield potential can be low. To cover all of the things that make variety selection important would take more words than this blog will allow, so we will first focus on the choosing the right maturity. First, I should say something about early planting of an early-maturing variety. 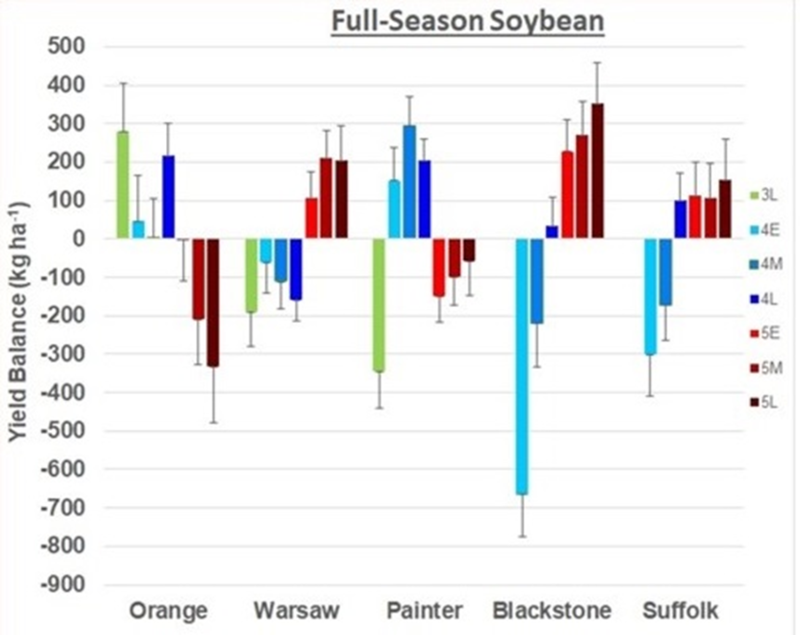 I define this as planting in April or early May a variety that is about one full maturity group earlier than the maturity that is most adapted, based on historical data, for your area. First, early-planted early-maturing varieties will always have a greater risk of poor quality seed. The seed of these varieties are maturing during September and early October, when the weather is relatively warmer. Warm and wet weather are perfect conditions for seed decay. 2018 has been one of the worse years for this, primarily due to excessive rainfall and much warmer September temperatures. To the right is an example of a maturity group (MG) 3 soybean planted in April in Madison County (MG 4 is the most adapted maturity for this area). Clearly, you don’t want to end up with this. While early maturing varieties have their advantages, their associated risks should keep the percentage of acres planted to a minimum. On the other hand, do not keeping all varieties in a tight maturity range. The performance of varieties within a certain maturity range will almost always depend the environment that they experience during pod and seed fill. If conditions are good (adequate rainfall, moderate temperatures, good soils) during that time, yields will be high. Unfortunately, the weather cannot be predicted in our humid southeastern U.S. environment. 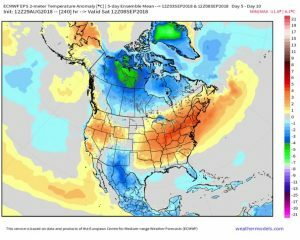 While late-July and early-August are generally our hottest and driest times of the year, we have just as good of a chance of going through a hot and dry period in June as well as July as well as August, and sometimes in September. Still, on average, certain relative maturity ranges yield more than others in the south central part of Virginia. Below are the average yield balance (no. 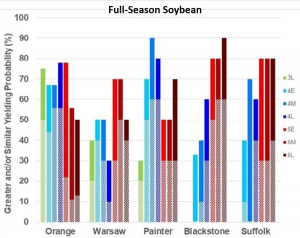 of bushels/acre greater or less than average) of a range of soybean maturities tested in our full-season variety tests over the last 10 years, separated by location. I’ll use our Southern Piedmont location (Blackstone) as an example of a location that shows the greatest yield gap between the earliest and latest varieties (nearly 15 bushels!). This is likely due that area typically experiencing the more stress (hot and dry) from late July through August than other regions. Similar but on the opposite end of the spectrum, MG 3 and 4 varieties work best at the Northern Piedmont (Orange) location. Maturity group 5 varieties generally not as adapted in that northerly environment. 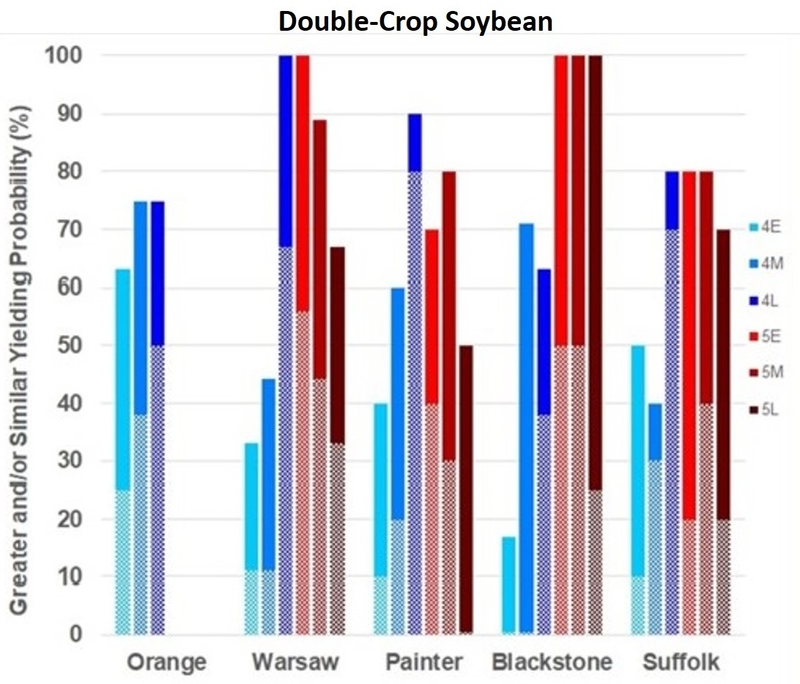 The northern and southern Coastal Plain sites (Warsaw and Suffolk) behave similarly to Blackstone – MG 5 outperform MG 4 varieties; but the yield gap between relative maturities is not as wide. Our Eastern Shore location does not follow the same trend of MG 5’s being the highest average yielding varieties as one moves south and east. Note that maturity group (MG) 5 varieties relatively better in the more eastern and southern locations of Virginia’s mainland, while MG 4 varieties tend to do better in our most northwestern location (Orange) and on the Eastern Shore (Painter). While MG 3’s don’t yield as well, the group 4’s are the highest yielding. Why? I attribute it to two things: yield potential and temperature. In general, this site has over time been one of our highest yielding sites. Although rainfall patterns are similar to other locations in Virginia, it is our coolest location (and there is usually a breeze) – both likely a water effect. Therefore, the site experiences less stress. So, pushing the critical pod- and seed-filling stages slightly earlier in the year are not as problematic. So, should you stick only with maturities that perform best on average? Not necessarily. 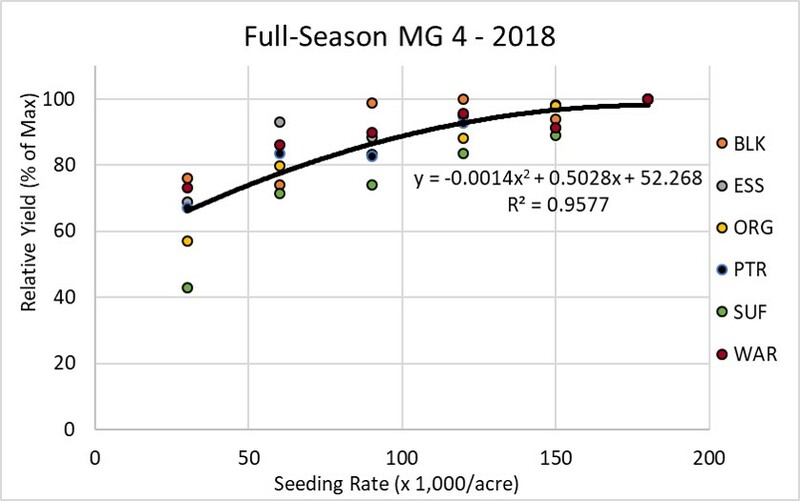 Using Blackstone as an example, note that although the late-group 4 varieties yield less than MG 5’s on average, they yield much better than earlier 4’s. And late-4’s yield just as well as 5’s in Orange and Suffolk. I stress that these are averages – 10-year averages of all varieties within those relative maturity ranges. Is it possible for the MG 4 varieties to yield more than the 5’s in Blackstone or Warsaw? Is it possible for MG 5’s to yield more in Painter? Yes! It just does not happen as often. We took that same data and calculated the probabilities, not absolute yields, of obtaining similar or greater yields of all relative maturity groupings tested. The results are below. Once again, to use the Blackstone data as an example, we can see that growing a late-MG 5 variety will yield at least as much as all of the other relative maturities 90% of the time (bar height). In addition, there is a 50 to 60% chance (height of the hatched portion of the bar) that the 5’s will yield significantly more than the 4’s. So, it seems that you will never go wrong with those varieties, correct? You’ll probably (~80% chance) not go wrong by growing a large percentage of those varieties, but should you should you only plant MG 5’s? I suggest that you do not grow only MG 5 varieties. There is still a 10 to 20% chance that the 5’s will yield less than the other maturities. Plus, there is a 60% chance that late MG 4 varieties will yield just as much as MG 5 varieties (and a 30% chance that they will yield more). Painter is another good example. 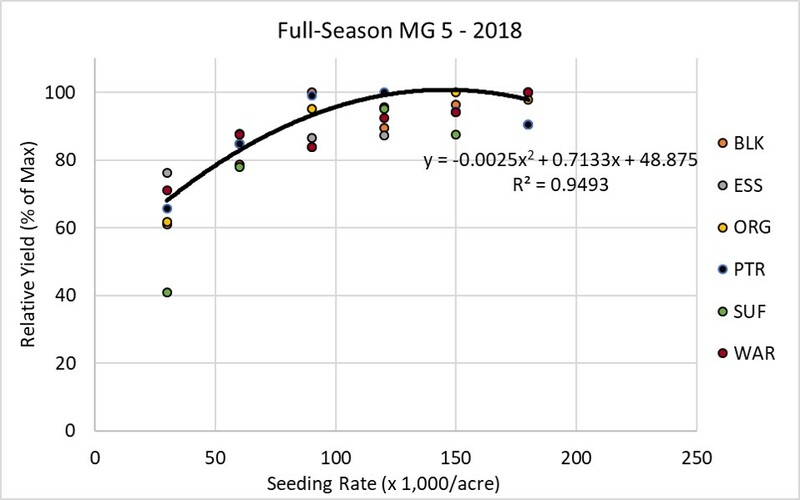 Although there is a yield gap between the 4’s and 5’s, there is a 50 to 70% chance that MG 5 will yield as well as MG 4 varieties. And there is a 30% chance that they will yield more! You can use the same thought process for the other locations. Plant 60 to 80% of your land to MG 5 varieties. We have also found that later maturities generally do better on our more droughty soils, so take that into consideration if possible. Plant 20 to 30 % to late-MG 4 varieties (4.7-4.9). If possible, plant these on your higher-yielding soils. We have found that this range of maturities have our greatest yield potential throughout Virginia if the weather cooperates. Plant 0 to 20 % to mid-MG 4 varieties. These are risky, especially on droughty soils or in double-crop settings. It is highly likely that these varieties will experience some (or a lot) of stress during the seed and pod fill stages. Plus, seed quality will almost always be poorer than other maturities. If you do grow these, harvest as soon as possible as seed quality will continue to degrade with time. Don’t plant these in April or early May. This places the most critical times of development (pod and seed fill) during late-July and August. And seed quality will be even worse since they will likely mature during the warmer part of the year. Still, yield potential can occasionally be quite high. Plant 30 to 60% of your land to MG 5 varieties. Plant 30 to 50 % to late-MG 4 varieties (4.7-4.9). Plant 10 to 20 % to early- and mid-MG 4 varieties. Plant 30 to 60% of your land to MG 5 varieties. In double-crop systems, reduce that percentage to 30 to 50%. Plant 30 to 50 % to MG 4 varieties (4.7-4.9). In double-crop systems, increase that to 50 to 70% late-4’s and plant 10-20% early-or mid-4’s. Plant 0 to 20 % to late-MG 3 varieties. Plant 20 to 40% of your land to MG 5 varieties. Plant 50 to 70 % to late-MG 4 varieties (4.7-4.9). Plant 10 to 20 % to early- and mid-MG 4 varieties. Plant 0-10% in double-crop. Plant 10 to 20% to late-MG 3 varieties. Plant 0 to 20% of your land to MG 5 varieties. Don’t plant MG 5’s double-crop. Plant 60 to 80 % to MG 4 varieties (4.7-4.9). Plant 10 to 20 % to mid- or late-MG 3 varieties. The proportion of MG 4 and 5 will ultimately depend on your risk tolerance. 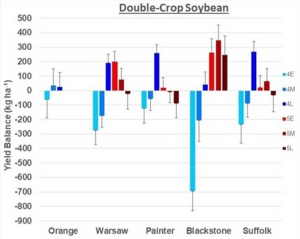 Note that as you move west and north, the risk of an early frost is greater; therefore, growing lots of late-maturing varieties may not be a great idea, especially double-crop, and the probability of slightly earlier maturities doing better is greater. Hopefully, this will give you some guidance in choosing your maturities within the next few weeks. IMPORTANT: Keep in mind that the yields and yield balances shown are an average of all varieties in those relative maturity groupings. This does not mean that every variety in those grouping perform in this manner on every field. Make sure that you first the variety that meets your match your field’s pest management needs; then, select a high-yielding variety within that relative maturity range. The purpose of the Virginia Soybean Yield Contest is to emphasize and demonstrate the practices necessary to produce maximum economic yields, to recognize those producers who grow high-yielding soybeans, and to gather data on the practices utilized by these outstanding producers. The Virginia Soybean Association in cooperation with Virginia Cooperative Extension sponsors this program. 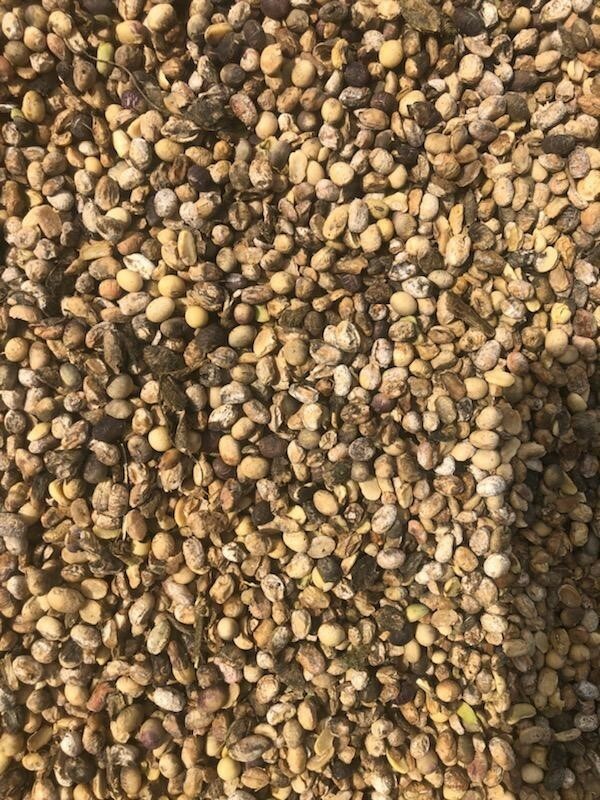 There are four Soybean Yield Contest categories: 1) Full-Season, Non- irrigated; 2) Double-Crop, Non-irrigated; and 3) Irrigated (Full-Season or Double-Crop; and 4) Most Efficient. A full-season system is defined as the grain or seed harvest of one summer crop (soybean in this case) from the same field in one year. 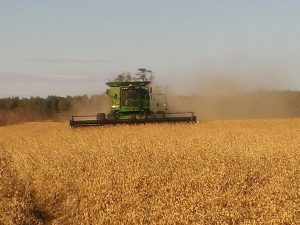 Double-crop is defined as planting soybean immediately following grain harvest of barley or wheat; thus harvesting two crops from the same field in the same year. If soybeans are planted after a cover, silage, or hay crop of small grain, then the entry will be considered full- season. If field has been irrigated one or more times, the entry will be considered an irrigated field and the will be placed into the irrigated contest. Yield alone (bushels/acre) determines the winners in the first three categories. Notice of intent to participate must be submitted to your county/city Extension Agent’s office 5 days before harvest or in an acceptable time frame for your Extension Agent. 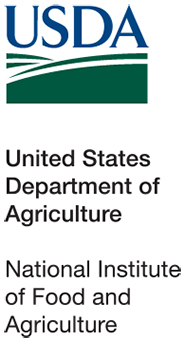 Extension Agents shall maintain the original set of record sheets and applications of all participants and send a copy to Dr. David L. Holshouser, Extension Agronomist, Tidewater Agricultural Research and Extension Center, 6321 Holland Rd, Suffolk, VA 23437 by Dec. 31. 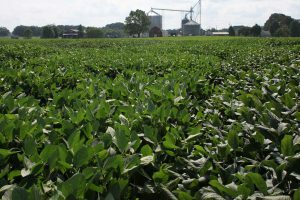 Application forms and a complete set of rules and regulations can be found on the Soybean Yield Contest website. 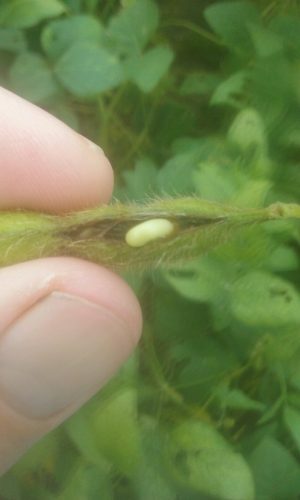 We are seeing immature soybean once again sprouting in the pods in Suffolk and Gloucester County, and I heard of this happening in other states. This seems to occur every 3-6 years somewhere. Although I don’t have a great explanation for why this occurs, it usually happens when there are good growing conditions early followed by 2-4 weeks of drought stress during pod formation, and then excellent conditions return for seed fill. Typically, it happens in big-canopied soybean (lots of leaf area) with lots of yield potential, but not enough pods (or big enough pods) to fulfill that potential. I think that the seeds enlarge so much that the pod splits. Keep in mind that I’m talking about immature seeds and pods. This can also occur after the crop matures (R7 to R8) when we get excessive rainfall after the seed in question has dried down. But, I have not seen that yet this year. There is little that you can do about it. Those sprouted seed will usually dry up on the plant and be blown out the back of the combine. Although there has to be some yield loss, I’ve not seen it to be very great. And, I suspect that if you did not notice the sprouted seed, you probably would not know that you had a loss. For more information, see previous blogs on this subject. 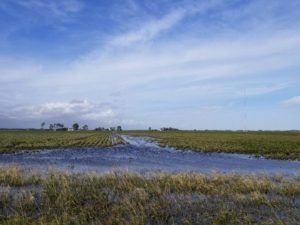 Although Virginia escaped the disaster caused by Hurricane Florence for the most part, Dr. Rachel Vann, N.C. State Soybean Extension Specialist, has written an excellent article, Soybean Considerations Following Hurricane Florence, on steps to evaluate flooded soybean. I suggest saving for future reference and hope that we won’t need it. While this post is likely too late for corn, it does apply to other crops. If you have yet harvested all of your corn, it’s never too late to calibrate your yield monitor. First, I am no expert in calibrating yield monitors. My experience with the process only involves showing up to the farm with an accurate weigh wagon (or we use their grain cart), riding with the combine operator as he harvests a known area of the field, weighing the load and obtaining a moisture from the load (with a calibrated moisture tester), then watch him do the calibration. Still, I understand the need for calibration although it takes time and may mean looking in the manual to learn or refresh one’s memory on the process. 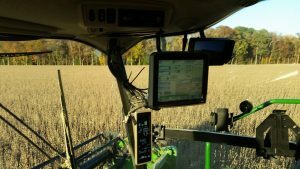 John Barker, Knox County Extension Educator (Ohio State Extension) wrote an excellent article, “It’s almost that time of year … Don’t forget to calibrate your yield monitor!”, which is a step-by-step checklist of how to do this. I highly encourage all to read it. We do have several weigh wagons located around the state that Virginia Cooperative Extension uses for our on-farm research. If you want me or one of your County Agents to help with this process, let us know. 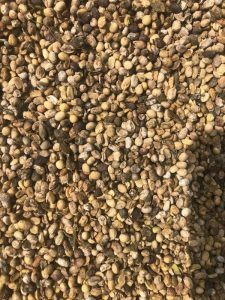 Finishing Out the Soybean Crop – What do we need for Good Yields? 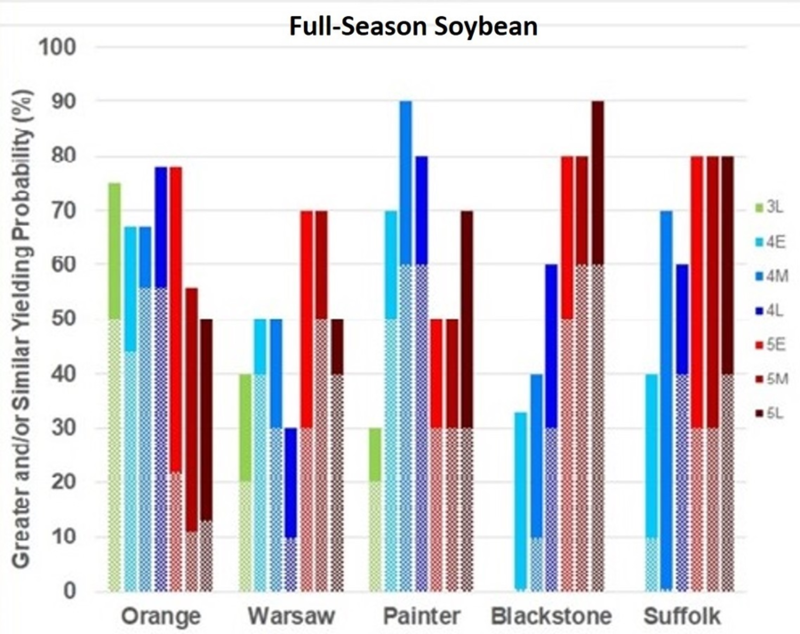 In general, we’ve had a good, but not great year for soybean in Virginia. Although many areas were hit with a 3 to 4 week dry spell during July, August rains kept us in the game. 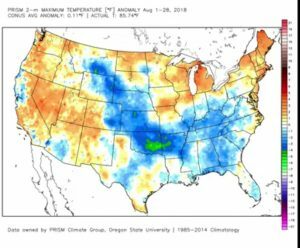 However, we did not see the ample rains or cool temperatures that we experienced in August of 2017, which resulting in record yields. Below is a summary of August rainfall and temperature anomalies for the U.S.
As you’ll notice, we had about average or slightly below average precipitation and average to slightly above average temperatures for most of Virginia’s soybean growing areas. So, I do not suspect that our yields will be as good as last year. Still, our earlier-maturing varieties planted in April or May should yield quite respectably considering that most have made over 50% of their yield – they have reached the R6 stage (see photo below). Yield of our later-maturing varieties, planted in May and early June, and our double-crop plantings are not quite there yet – much of our yield is yet to be determined – R5 soybean have only made roughly 25% of their yield at that time. So, what do we need for good yields? Rain is obvious. Full-canopied plants with adequate soil moisture will draw about 0.25 inches of water/day from the soil. But, we also need cool temperatures – soybean do not generally like 90+ degree days, especially when forming seed. Below is the 10 day rainfall and temperature forecast for the U.S., and it does not necessarily look good for us. Note that the rainfall is predicted accumulation and the temperature map shows anomaly. Although we should get some rain this weekend only (more in northern parts), temperatures are supposed to be above average. But, forecasts are only forecasts. The weather does change. I hope we will get the needed rainfall that they are predicting this weekend. But a big ridge appears to be setting up over the Mid-Atlantic states for next week. 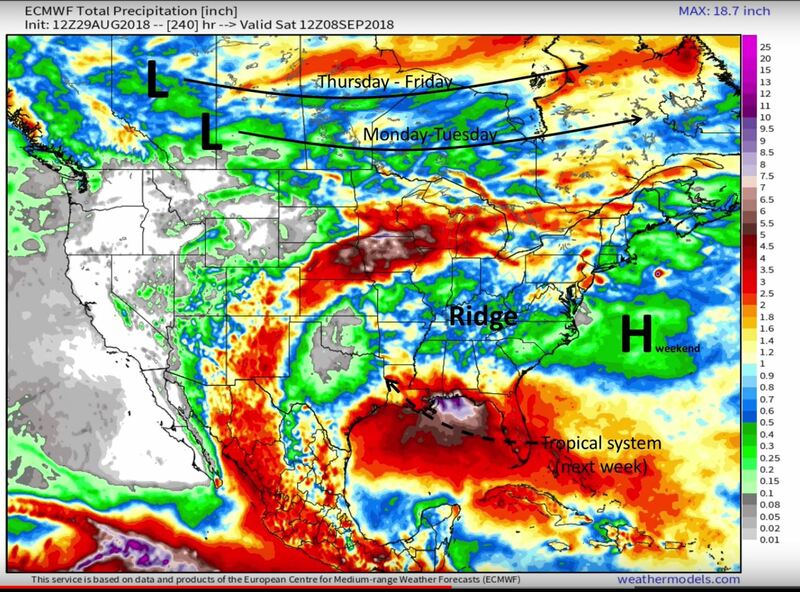 This usually means warm weather and only at the edges of ridges do we normally see rainfall – note the heavy rainfall predicted from Nebraska through Michigan. I don’t mean to discourage, just to inform. We still have decent soil moisture, at least in the subsoil. With rain this weekend, we should get through next week without too much harm to the crop. Our double-crop soybean (assuming late maturity group 4’s and group 5’s planted in late June to July) are just now in the R5 stage – it usually takes 80 to 100 days from planting to reach R6, depending on maturity and planting date. So some timely September rains will usually result in good double-crop soybean. When will our yield be “made”? 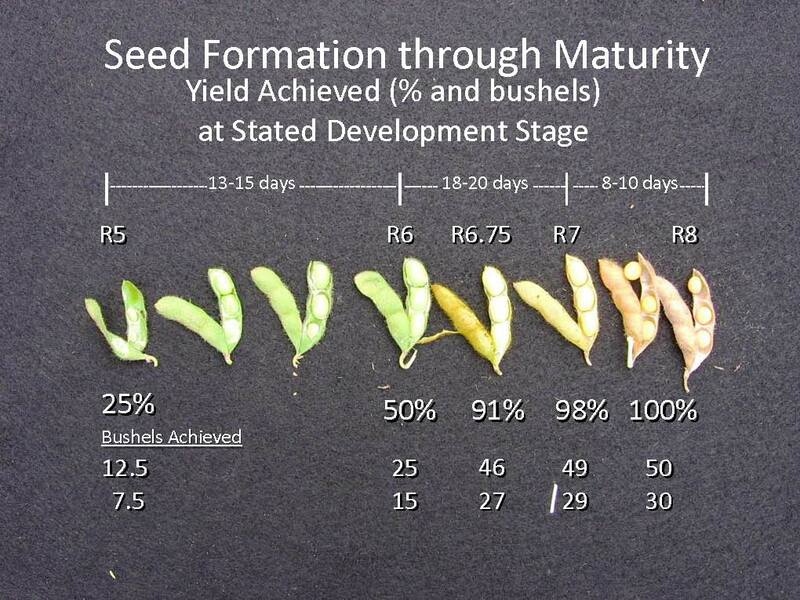 Below is table showing the number of days to soybean physiological maturity (R7; 95% of yield has made). When can we expect to be harvesting our soybean? Full maturity is reached about 2 weeks after R7 and harvest can proceed after the soybean have dried down to a harvestable moisture, usually within a week after R8. 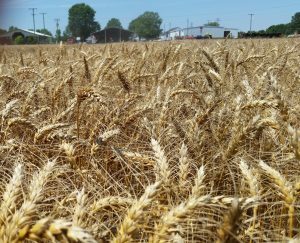 The 2017 Virginia On-Farm Wheat Test Plots have been published and are now available on the Virginia Cooperative Extension website. For more information or a hard copy, contact Mike Broaddus, Extension Agent, at the Caroline County office. he demonstration and research plot results discussed in this publication are a cooperative effort by seven Virginia Cooperative Extension agents, extension specialists from Virginia Tech, and a VCE summer intern. We are proud to present this year’s on-farm small grain plot work to you. We hope the information in this publication will help farmers produce a profitable crop in 2018. The Virginia Grain Producers Association is proud to announce the 2018 Virginia Wheat and Hard Wheat Yield Contest Winners. This year’s winners come from counties across the Commonwealth and have once again proven that Virginia producers are capable of achieving exceptional yields. Yield contests, such as this, are an important element in our mission to highlight and communicate the accomplishments of Virginia agriculture to our industry partners and the general public. 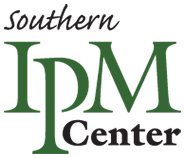 The top-ranked growers will be given cash prizes donated by the providers of their winning seed, and will be fully recognized with a plaque presented by one of our industry leaders at the Virginia Grains and Soybean Annual Conference next February. At 108.6 bushels per acre, Alan Welch’s wheat took first place. Katie Myer’s hard wheat yield of 85.7 bushels per acre claimed first prize. The hard wheat portion of the contest is sponsored by Mennel Milling to highlight the planting of hard wheat in the Commonwealth. Hard wheat is primarily used as a bread wheat. The majority of the wheat grown in Virginia is soft red winter wheat, which is used in bakery products such as flat breads, cakes, pastries and crackers. Many thanks go out to The Mennel Milling Company of Virginia, Pioneer, AgriMaxx, and UniSouth Genetics (USG) for sponsoring the Small Grain Yield Contests.